For asylum and return (i.e. expulsion) procedures to be implemented effectively, people need to be at the disposal of the authorities so that any measure requiring their presence can be taken without delay. To achieve this, EU Member States may decide to hold people in closed facilities. Less intrusive measures, which are usually referred to as alternatives to detention, reduce the risk that deprivation of liberty is resorted to excessively. In light of the significant number of asylum seekers and migrants reaching the EU’s external borders and moving onward to other EU Member States, there is a danger that deprivation of liberty may be resorted to excessively and in cases where it is not necessary. With this compilation of legal instruments and other resources, FRA seeks to provide guidance to policy makers and practitioners on the use of non-custodial measures for asylum seekers and people in return procedures. According to EU law, as well as Article 5 of the European Convention of Human Rights, deprivation of liberty for immigration-related reasons can only be used as a measure of last resort. An assessment needs to be made in each individual case to determine whether all the preconditions required to prevent arbitrary detention are fulfilled. Under Article 8 of the Reception Conditions Directive 2013/33/EU and Article 15 of the Return Directive 2008/115/EC, detention must not be used when less intrusive measures are sufficient to achieve the legitimate objective pursued. Most of the wide array of alternatives to detention imply some restrictions on freedom of movement and/or other fundamental rights. Any restrictions to these rights must be in conformity with Article 52 (1) of the EU Charter of Fundamental Rights. This means that limitations must be provided for by law, must genuinely meet objectives of general interest recognised by the Union or the need to protect the rights and freedoms of others, respect the essence of the right, and be proportionate. Alternatives to detention must, therefore, be distinguished from unconditional release from detention or unrestricted placement in open facilities. This obligation may be imposed alone or together with other alternatives, such as the duty to stay in a particular location or area. It is a soft measure that essentially serves to ensure that valid identity and travel documents are not lost or destroyed during the time required to prepare the return and removal process. Such restrictions impose the duty of remaining at a particular address or residing within a specific geographical area, often combined with regular reporting requirements. The designated places can be open or semi-open facilities run by the government or NGOs, as well as hotels, hostels or private addresses. The regime imposed can vary, but people generally have to be present at the designated location at certain times, while absences are usually only allowed with a well-founded justification. In the context of criminal law, it is not uncommon to allow the release of a detained person on condition of bail, which will be forfeited if the person does not report to the authorities. Release based on financial guarantees is infrequently used in asylum and pre-removal proceedings, partly because it is assumed that many asylum seekers or third-country nationals in return procedures would not have the necessary means to put up bail. This alternative obliges people to report to the police or immigration authorities at regular intervals, and is one of the more frequent alternatives to detention found in national legislation. Reporting duties on a daily, bi-weekly, weekly or even less frequent basis may also be imposed as an additional requirement to the obligation to reside in a specified area or location. This is an innovative alternative to detention that combines classical social work with time spent at designated places. Asylum seekers or people in return procedures are placed in open facilities and provided with individual coaches or counsellors to inform and advise them about their situation and options. This form of alternative was established following evidence that compliance with a return decision depends on the level of trust the person affected by the decision has in the authorities of the host country. Such trust is created through individual counselling and contacts with external actors, such as NGOs. Electronic monitoring or tagging is primarily used in the context of criminal law. Its use as a substitute for immigration detention is limited. Electronic monitoring is the most intrusive of the various alternatives to detention, as it substantially interferes with a person’s right to privacy, restricts freedom of movement and can have a negative impact on their dignity. It can also lead to discrimination through the potential association of people wearing an electronic device with criminals. The selected instruments are presented by category, beginning with legal instruments (binding and non-binding), and then continuing to case law, expert guidelines and research papers. The left column of each table lists the documents in question with an embedded hyperlink to the full text. The right column reproduces key excerpts from these documents, with additional explanations in italics where relevant. A short introduction precedes each table. Using alternatives to detention benefits both the state and migrants, as on the one hand they are more cost-effective and on the other they are less intrusive and more respectful of fundamental right than deprivation of liberty. 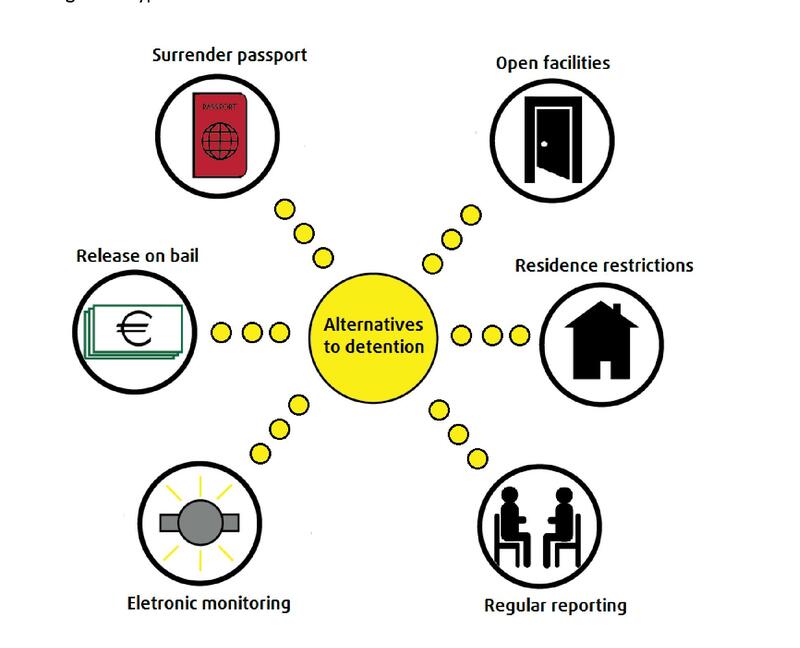 Although virtually all EU Member States provide for the possibility of alternatives to detention (current reforms in Malta are expected to introduce fully-fledged alternatives in the near future), they are still too little applied and when they are, it is primarily in cases involving particularly vulnerable people. Several EU Member States do not yet collect statistics on alternatives to detention, which makes it difficult to assess the extent to which they are used in reality. This entry was posted in 1.1 News from the Area of Freedom, Security and Justice, 3. Fundamental rights - Charter, 5. Asylum & refugees rights' policies, 6. Borders control policies (Schengen), 7. Immigration policies, 7.1 Regular immigration, 7.2 Irregular immigration, 8. Judicial cooperation, 9. Internal security -police cooperation, Security and Justice by edecapitani. Bookmark the permalink.